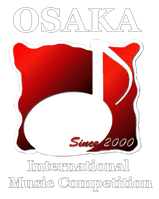 OSAKA International Music Competition, Regional Competitions are formed by non-profit organisations. Website maintenance, venue organizing, additional costs in running the regional competitions are generously contributed by a few of our committee members. It would be of tremendous help if you could donate to support the competition so we could look forward to organizing it the next year too! Thank you.